Fort Davis National Historic Site is on the northern edge of the town of Fort Davis, Texas. 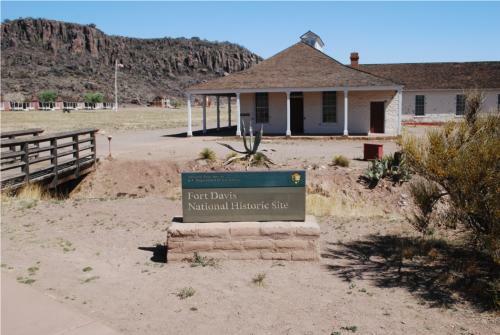 Fort Davis is managed by the National Park Service and is located in west Texas in the Davis Mountains near the McDonald Observatory. 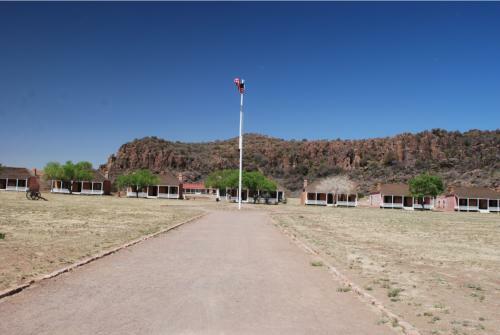 Fort Davis is the site of an army fort that operated from 1854 until 1891. The fort is one of the best remaining examples of a frontier military post. Some of the orginal structures are still standing but most are gone with only the foundations that still remain. They are doing some reconstruction work on some of the buildings. The following information is a brief history of the fort. It was taken from the National Park Service brochure. A key post in the defense system of west Texas, Fort Davis played a major role in the history of the Southwest. From 1854 until 1891, troops stationed at the post protected emigrants, freighters, mail coaches and travelers of the San Antonio - El Paso Road. Today Fort Davis is one of the best remaining examples of a frontier military post. It is a vivid reminder of the significant role played by the military in the settlement and development of the western frontier. The fort was established on the eastern side of the Davis Mountains, in a box canon near Limpia Creek, where wood, water and grass were plentiful. It consisted of primitive structures and was located behind the present day Officers' Row. (The foundations of several buildings from this earlier fort can still be seen today.) Named after Secretary of War Jefferson Davis, the fort was first garrisoned by Lt. Col. Washington Seawell and six companies of the Eighth U.S. Infantry. From 1854 to 1861, troops of the Eighth Infantry spent much of their time in the field pursuing Comanches, Kiowas and Apaches who attacked travelers and mail stations. With the outbreak of the Civil War and Texas' secession from the Union, the federal government evacuated Fort Davis. The fort was occupied by Confederate troops from the spring of 1861 until the summer of 1862 when Union forces again took possession. They quickly abandoned the post, and Fort Davis lay deserted for the next five years. Few of the fort's structures remained when Lt. Col. Wesley Merritt and four companies of the newly organized Ninth U.S. Cavalry reoccupied Fort Davis in June 1867. The building of a new post, just east of the original site, began immediately. By the end of 1869, a number of officers' quarters, two enlisted men�s barracks, a guardhouse, temporary hospital, and storehouses had been erected. Construction continued through the 1880s. By then Fort Davis had become a major installation with over 100 structures and quarters for over 400 soldiers. Fort Davis's primary role of safeguarding the west Texas frontier against the Comanches and Apaches continued until 1881. Although the Comanches were defeated in the mid 1870s, the Apaches continued to make travel on the San Antonio - El Paso Road dangerous. Soldiers from the post regularly patrolled the road and furnished escorts for wagon trains and coaches. The last major military campaign involving troops from Fort Davis occurred in 1880. In a series of engagements, units from Fort Davis and other posts, under the command of Col. Benjamin Grierson, forced the Apaches and their leader Victorio into Mexico. There Victorio and most of his followers were killed by Mexican soldiers. With the end of the Indian Wars in west Texas, garrison life at Fort Davis became more routine. Soldiers occasionally escorted railroad survey parties, repaired roads and telegraph lines and pursued bandits. In June 1891, as a result of the army's efforts to consolidate it's frontier garrisons, Fort Davis was ordered abandoned, having "outlived it's usefulness". If you are visiting Fort Davis, I suggest that you also take the short drive up to the McDonald Observatory. You should check their schedule to see when they have their "star parties" or the sun observation. If you do the sun observation, you will get a chance to tour two of the telescopes that are used for research. Very interesting and worth the time.